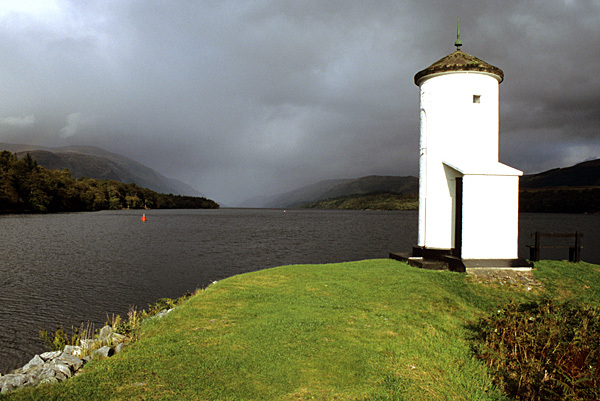 Sunlight catches a lighthouse beside Loch Lochy as a storm moves through the Great Glen. 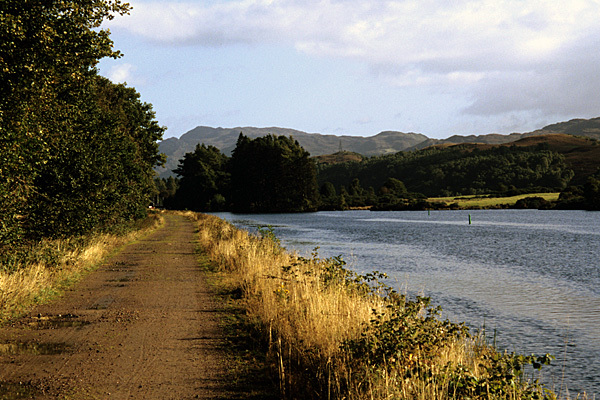 The Caledonian Canal is accompanied by a broad track as it runs towards Fort Augustus. A glimpse of Loch Ness from the forested slopes alongside it. The Great Glen is a remarkable, ruler-straight glen slicing south-west to north-east, from coast to coast through the Highlands of Scotland. It is based on the ancient Great Glen Fault, which tore the mountains apart millions of years ago and is still capable of giving the occasional shudder. 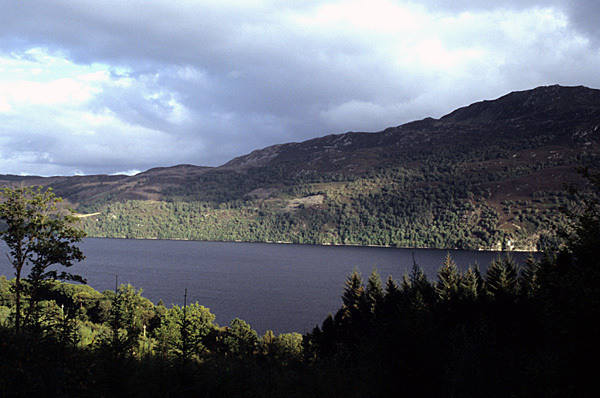 The Great Glen contains three lochs: Loch Lochy, little Loch Oich and the enormous Loch Ness, home of a legendary 'monster'. The low-lying glen has attracted canal-cutters, road-builders and railway engineers, all seeking a coast to coast route through the Highlands. More recently, the glen has been blessed with a long-distance footpath offering walkers an easy coast to coast walk through the Highlands. The route links at Fort William with the long-established West Highland Way, and has its other terminus at the Highland capital of Inverness. When the route was being checked, it was walked immediately after a trek along the West Highland Way, and immediately before a trek along the Speyside Way. The route has been described both ways in the guidebook, showing the route highlighted on OS Landranger mapping, along with plenty of pictures. As an easy, low-level trail, the Great Glen Way would serve well as an introduction to long-distance walking, and it could be completed at most times of the year. The entire route was re-walked for the second edition, with the route description overhauled, including newly-created high-level stages. All the facilities along the trail were checked. A special companion Great Glen Way map booklet, containing extracts of Ordnance Survey 1:25,000 mapping, now accompanies the latest edition of the guidebook.